The Supreme Judicial Court’s practice of employing law clerks can be traced to a justice of that court from the nineteenth century, Horace Gray. 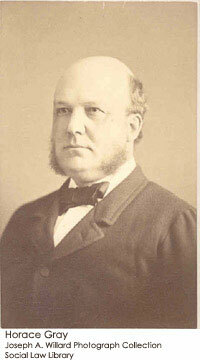 Gray was born in 1828 in Boston to a family prominent in shipping and commerce. He graduated from Harvard College in 1845 and, after traveling in Europe, returned home to enter Harvard Law School in 1848. Admitted to the bar in 1851, he established a law practice in Boston. Soon after beginning his practice, Gray was called to the Supreme Judicial Court to fill in for the Reporter of Decisions, Luther S. Cushing, who was ill. Gray accepted the temporary position and completed the final volume of Cushing’s Reports. When Cushing died in 1854, Gray was appointed to succeed him. He would be the Reporter on sixteen volumes of the Massachusetts Reports. While he was Reporter, Gray’s strong anti-slavery views caused him to join the Free Soil Party and then the newly formed Republican Party. In 1864, during the Civil War, at the time the Army of the Potomac was besieging Petersburg, Virginia, and General Sherman was approaching Atlanta, Governor John A. Andrew appointed Gray to the Supreme Judicial Court. At age thirty-six, he was the youngest man ever appointed to the court. In 1873, he was named Chief Justice. In 1881, Gray’s friend, Senator George F. Hoar of Massachusetts, urged President Garfield to appoint Gray to the United States Supreme Court, but Garfield was assassinated before he could act on this proposal. 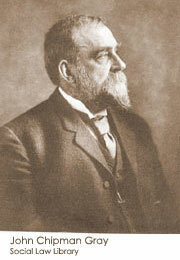 Many thought that Gray’s chance to join the U.S. Supreme Court died with President Garfield. But Senator Hoar pressed the new President, Chester A. Arthur, to appoint Gray. To almost universal surprise, Arthur nominated Gray who served on that Court for twenty years. Gray suffered a stroke in 1902 and resigned from the Court. Two months later he died in Nahant, Massachusetts. His opinions can be found in forty-three volumes of the Massachusetts Reports and eighty-one volumes of U.S. Supreme Court cases. 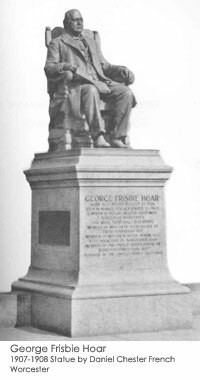 Horace Gray instituted the practice of using law clerks due to rising appellate caseloads. About the time Gray became an Associate Justice of the Supreme Judicial Court, appellate courts in the United States were hit by a tidal wave of cases. Among the reasons for this phenomenon were the industrial revolution, the spread of railroads, rapid developments in corporate and tort law, and population growth. In 1873, partly in response to rising appellate caseloads, the Legislature increased the number of Supreme Judicial Court justices to seven and that same year Gray was named Chief Justice of that court. Gray assumed a greatly increased workload. Not only was he writing almost twenty-five percent of the court’s opinions, but also he was presiding over trials (torts, divorce, contract, and capital crimes) that were still part of the Supreme Judicial Court’s jurisdiction. The new chief justice needed help. In 1875, he turned to his half brother, John Chipman Gray, a professor at Harvard, to recommend a recently graduated and highly ranked Harvard Law School student to fill a new one-year position that Gray called “secretary” and we now identify as “law clerk.” One of the first of Gray’s new law clerks was none other than Louis D. Brandeis. As it appears that the new position was not publicly funded, it is most likely that Gray paid his law clerks out of his own pocket. 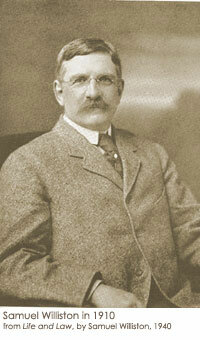 Gray was the first judge in the United States to use law clerks. When he joined the United States Supreme Court, in 1882, Justice Gray continued the practice, which eventually spread to courts throughout the country. In 1886, Congress acted upon the recommendation of the Attorney General and provided for a “stenographic clerk” for each justice of the Supreme Court at a salary of $1,600 per year. Justice Gray did not use his law clerks as mere “stenographic clerks.” A description provided by Gray’s law clerk, Samuel Williston (remember Williston on Contracts? ), indicates that Gray used his law clerk in the traditional manner—reviewing newly filed cases, discussing opinions by other justices, engaging in a vigorous colloquy on opinions, and drafting memoranda. 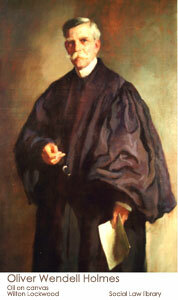 Shortly after Oliver Wendell Holmes, Jr., joined the Supreme Judicial Court in 1882, he wrote in a letter: “We are very hard worked and some of the older judges affirm that no one can do all the work without breaking down.” When he joined the U.S. Supreme Court, Holmes took up Gray’s practice of employing a new honor graduate from Harvard each year. Like Gray, Holmes relied on recommendations from Professor John Chipman Gray. Later Holmes relied on the advice of Felix Frankfurter. Around the time of Holmes’s retirement from the Supreme Court, in the 1930s, the institution of law clerks became entrenched in the federal judiciary when it was introduced to the lower federal courts. Unfortunately, the available list of law clerks in the Supreme Judicial Court goes back only to the fall of 1922 and the law clerks between Gray’s first clerk in 1875 and 1922 are thus unknown. Fortunately, a great deal is known about Louis Brandeis. The law clerk list that is available is an impressive roster of notable attorneys. In addition to the U.S. Supreme Court justice already mentioned, included are a Supreme Judicial Court justice, several chief justices of other Massachusetts courts, a governor and an attorney general of the Commonwealth, many judges, state and federal, a reporter of decisions, a law school dean, numerous law school professors, a frequently-quoted doctor/medical ethicist, bar association presidents, and several novelists. Women’s names first show up on the list in 1943. World War II, no doubt, played a role in that. One of those early female clerks, Marilyn M. Sullivan, became Chief Justice of the Land Court—the first female chief justice in Massachusetts history (at the present time, four of the nine chief justices of the Massachusetts courts are women). On June 11, 2002, former Supreme Judicial Court Law Clerks held their first formal reunion to renew old friendships and to discuss the establishment of a permanent organization from whose members new ideas about the historic restoration program for the John Adams Courthouse and for future programs related to the Court and its 310-year history might be produced.